The queen of pop, Adele dominated the 59th annual Grammy Awards by picking up all the top awards including Album of the year, Record of the year, Song of the year, Best pop solo performance and Best pop vocal album. The legendary singer took away the album, record and song of the year categories in 2012. 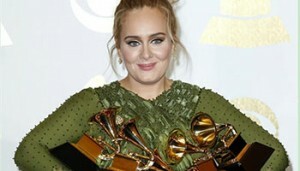 Adele is the first singer to take all the top three awards from Grammy twice.